Due: Beginning of week 4’s class (24th March 2010) *note this was originally due on the 17th, but you now have a week’s extension. The objective of Assignment 1 is to introduce you to the SUBTRACTIVE 2D numeric fabrication process, focusing on the technique of cutting using a LASER CUT machine. Each student will be given the chance to work directly with the machine (supervised by an instructor), use the specific software to write the machine’s instructions, place the material, and oversee his/her job. In terms of design, the intention of the assignment is to produce a large scale installation for the whole class, with each student contributing in the design and fabrication of one “waffle”. Students will be given specific geometric constraints (400mm x 400mm) in order to standardize the edges of their ‘waffle’, to allow for their connection in different arrangements. A Grasshopper definition will be provided to students to create their waffles. Edge conditions: No curvature on the edges of the surface – this is to allow for each piece to match up with the others. Material: 3 mm plywood* sheet for your final waffle. Test models can be made in any material (boxboard, cardboard). Remember to adjust your notch sizes if your material thickness changes. * ply sheets can be purchased at Manifax (166 Gertrude St, Fitzroy ph: 94194166 ), Bunnings and other hardware shops for about $6 for a 900×600 sheet. 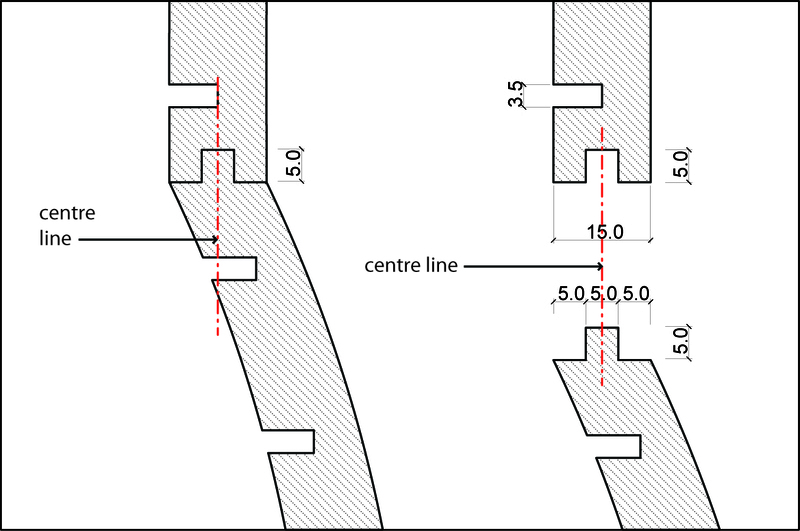 Notch Tolerance: you will need to make your notch sizes a little bit bigger than the thickness of the plywood so that the model will fit together easily. Use a notch size of 3.5mm for 3mm plywood. End connection – finger join detail – see image below for a guide. we will go over this in class.